Some kids just can't sit still. That's not just the name of a book (about kids with ADHD), it is also a fact of life. We meet a lot of parents and kids in our shop and we love seeing a kid who might otherwise have trouble staying focused on something becoming totally engrossed with one of our puzzles or games. This particular single-player game has been particularly attractive to kids in our shop who spend anywhere from ten minutes to half an hour working on one of the challenges. Meanwhile, their parents stand by amazed that something tactile like this, not a computer game, has totally captured their child's imagination and attention. The folks at Smart Games do a great job of creating single-player games like these that are portable, fun, engaging, easy to learn but challenging enough to keep a child going and going and... wait for it... sitting still! 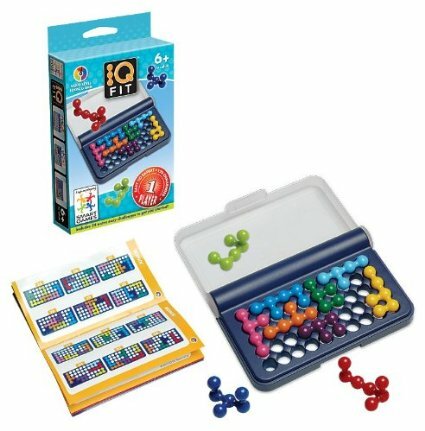 IQ-Twist is a unique new puzzle game. Fit all the 3D-puzzle pieces on the game board in such a way that it turns into a (flat) 2D-image without holes. A super-fun thinking game with a 120 increasingly-difficult challenges which will require some ”deep” thinking to find the correct the solution! Portable and compact, great for travelers of all ages!